I returned to the Gibson County Library in Trenton to continue my research into the early days of the Carne family in Gibson County. Mrs. Mattie, remembering all the books I must have purchased on my last visit with my microfilm copy payments, seemed really glad to see me. I'm not so sure about her friend there though. When I came in on the second day, I found the only working microfilm machine occupied. Asking "Who are YOU chasing? ", I was surprised to find that this was Wilbert Overall, and he was chasing some of the same folks as I! Near as I can figure, we're about 4th or 5th cousins. Swapped some very useful information with him. You'll find him on the cousin's pages. 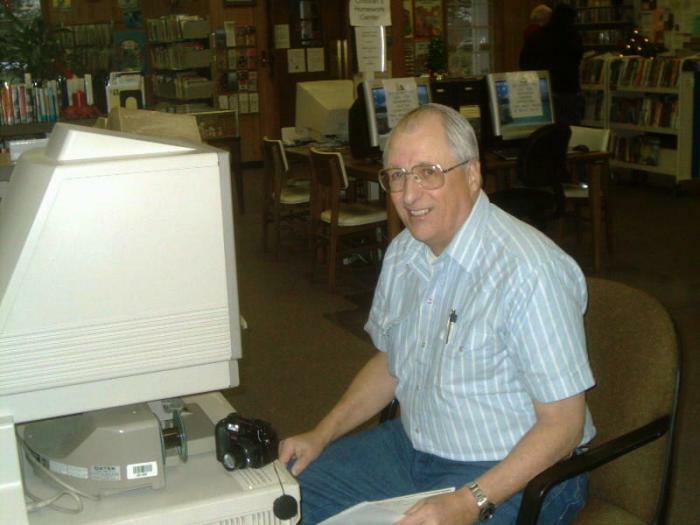 Wilbert later relinquished the microfilm reader to me, and retaliated by taking my picture. In our conversation I learned that Wilbert had brought his aunt, Mrs. Johnnie Jamison back to Dyer after a visit, and was staying with her. I finally managed to locate the will of my Great Great Grandfather, Dr. John David Carne, in the microfilm reels, but it was totally illegible, a fact noted by the micro-filmers. The only option left was a visit to the County Court House in Trenton. 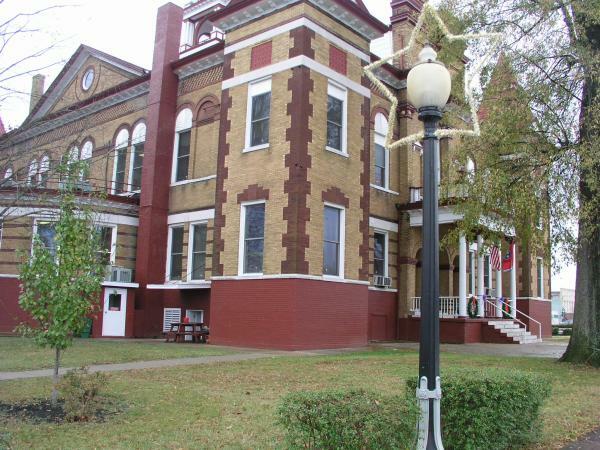 This nicely restored old Court house was built ca. 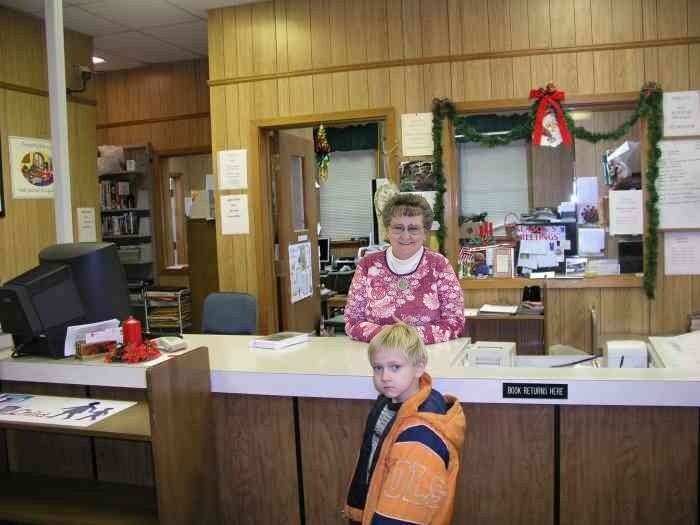 1900 and is the fifth one to have served Gibson County. 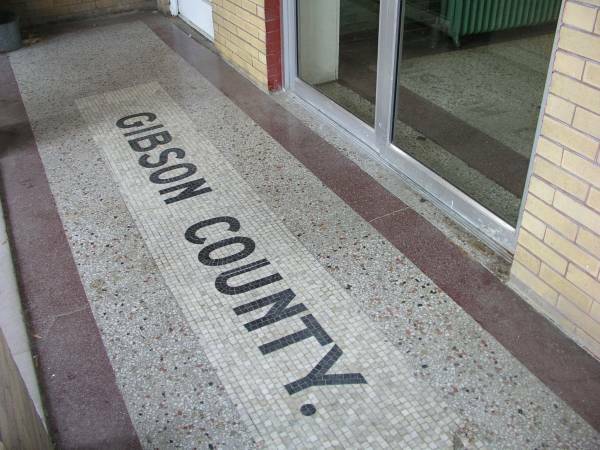 The entrance on the West side still sports a mosaic of tile spelling out "Gibson County."